William T. Trego | Catalogue Raisonné | Mounted Soldier, n. d.
The soldier appears to be an enlisted man of a horse artillery unit, perhaps of the Civil War era or even later, in the time of the Indian Wars. 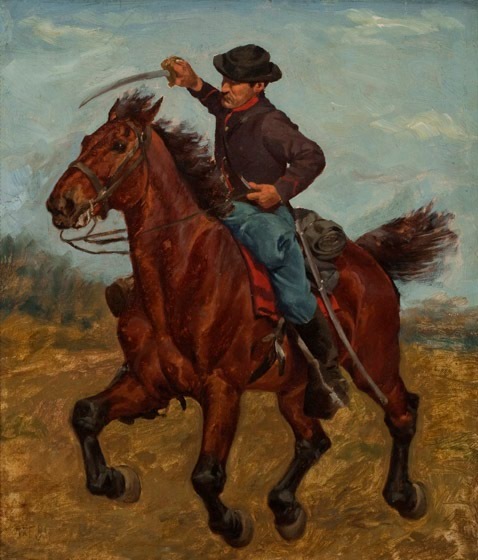 The model for this work may have been James “Jimmy” Krout of North Wales who is known to have posed for Trego’s painting of a soldier of the Spanish-American War in 1900. For action scenes such as this, Trego had models pose on a barrel hanging from chains the ceiling of his studio, at the rate of one dollar a day. This work may be one of Trego’s sketches for a larger more finished work.